We’ll explain when you can bend the rules a little with your 3D prints, and when to adhere to the solidity check guidelines on our site. One of the most common questions that our customer support team fields is why an object doesn’t pass our immediate solidity check process, and what our customers can do to bypass this process. Although we don’t recommend our “Print it Anyway” process for everything we do know that some of our risk-taking customers might want to roll the dice. Here is a bit of information regarding when you want to use this feature for your 3D Prints and how to put in a request to override our immediate solidity check process. Uploading your item to our site means a couple things, it means that your item will remain private unless you indicate that you prefer to make it public, it means that you’ll receive an instant price quote and it means that your file will undergo a printability check. 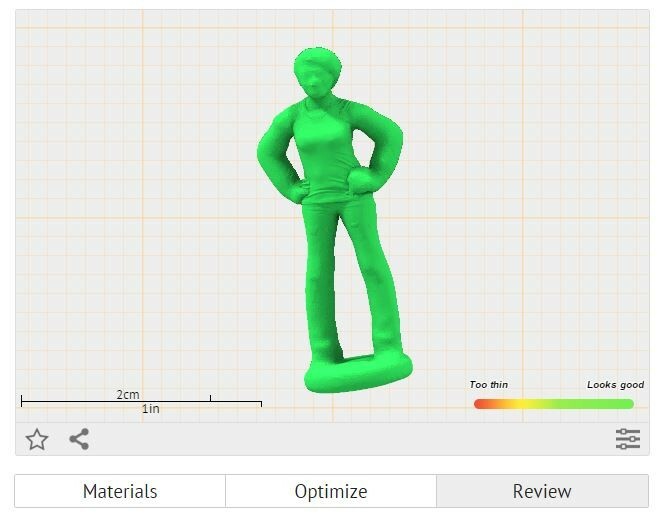 We are going to use a 3D scan to show examples of when you should adhere to the rules and when you can afford to take a risk with your 3D Prints. 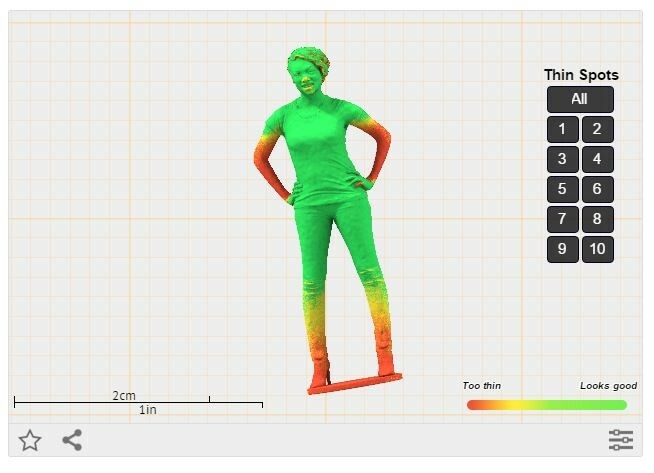 If your 3D Print isn’t passing the solidity check and you get red areas that indicate that your model is too thin, there is a way to override this issue. We typically recommend trying a different material first, in this case we are using the multi-color material. Each material has special requirements regarding wall thickness for example if you’re thinking of printing a selfie in the multi-color material like the one below the guidelines are different than our white plastic. Another option is to use our built in thickening tool which will automatically increase the wall thickness to the required thickness of your chosen material. You can see below that the thickening tool is not a good idea for this selfie. We have an entire article on our thickening tool it covers when you’d want to use it and how it works. In this case we started to increase the size of the model until it was completely green, meaning that it would successfully print. If you have questions about our solidity check they are all answered in this article. But let’s say you don’t want to increase the size of your print. 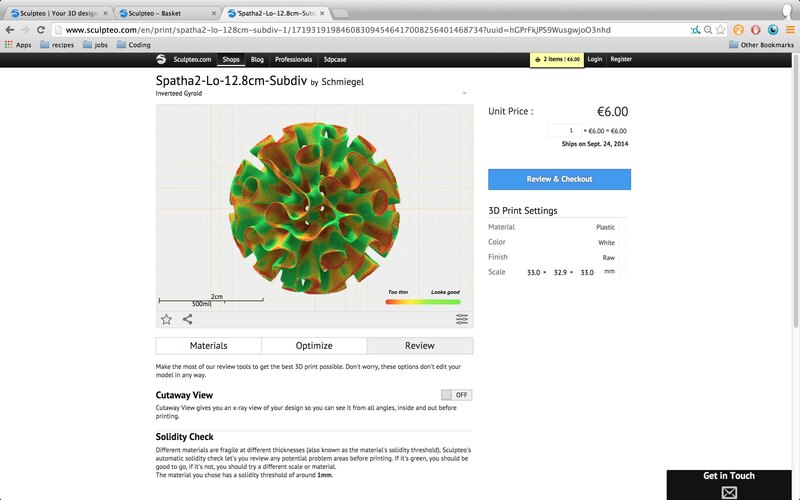 To use Sculpteo’s print it anyway feature you can just email us at contact@sculpteo.com with your reference number and we will be able to inform you about what to expect regarding your 3D Print. For more information on our optimization tools or our repair tools visit our Resources Pages.